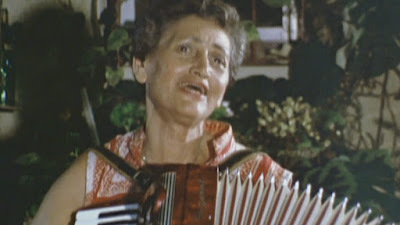 Over the last decade there has been a steady flow of films coming from Claude Lanzmann cut from the material left out from his legendary SHOAH. Despite being nine hours long there were things that simply didn’t fit. Some of the films were simply fuller interviews of what made the finished films. Other bits were things that simply didn’t make it because they didn’t fit into the finished film. As a result we have ended up with small gems such as THE KARSKI REPORT which hauntingly explains why no one did anything about the Holocaust- they simply didn’t believe the reports; or SOBIBOR, OCTOBER 14,1943,4PM which reveals one of the greatest tales of survival you’ll ever hear. Joining the historical record is Lanzmann’s latest masterpiece THE FOUR SISTERS. 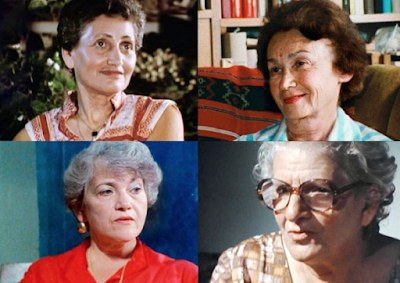 the story of four women who somehow survived the wars. The films are exactly all his others quiet monologues that reveal what exactly happened. Yes, Lanzmann quietly nudges the tale but in all the films we are close on the faces of the women who dredge up a horrific time of their lives. As with all the other Lanzmann films we are at first surprised that the women tell their tales so calmly (relatively), but after a while we fall into their tale and the matter of factness overwhelms us and we are the ones left shaken. While connected and billed as a series the four films are getting separate screening over several days at the New York Film Festival. Before I saw the films I thought this was a bad idea since I thought bingeing was the way to go. However now that I’ve seen the films I realize that the films are best seen away from the others. The films are such that they must be allowed to stand on their own. They shouldn’t be blended together. More importantly the films need to spaced because they are so quietly affecting that hours afterward you will still be thinking about them. I split up screening the films over the course of a about ten days, two on two days one week and two over two days the next and I found that I was still rocked and affected. As “one” film they are a worthy companion to SHOAH in that they illustrate bits of history most people probably aren't aware of, more so since the events described are now close to a century old and have been replaced with fears of terrorism and cybercrime. And despite calling many of the enemies of freedom, real or perceived, Nazis or fascists most people really have no idea what the exactly happened. Because people don't really know these and all of Mr Lanzmann's films should be required viewing...unfortunately they are not and I don't think that most defenders of freedom will ever look toward the films, which is sad because they are truly compelling. Looking at the titles of each film I was very curious as to what each one means. While not apparent going in the titles do make sense once you get through each film. I will not explain the titles since I would prefer you to discover the meaning on your own. 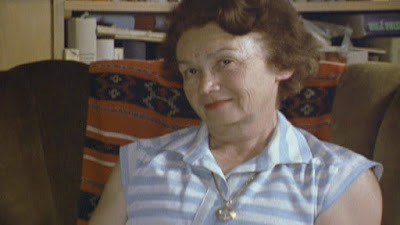 Moving film about Ada Lichtman from Krakow Poland who ended up in in Sobibor Concentration Camp. 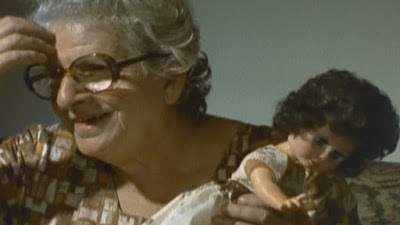 Ada's tale of confinement is notable for the dolls she helped to collect from people coming into the cmp. She helped to prepare them for new owners. Sitting with her recently deceased husband’s diary in her hand Hannah Marton from Cluj recounts the story of Hungary’s Jewish population and the extraordinary tale of a handful of them. It’s a such an amazing story that I actually watched the film twice because on some level I wasn’t believing what I was hearing. The story of the Hungarian Jews is an unlikely one in the face of all horrible things that happened. Since Hungary was allied to Germany they were not invaded by the Nazis until late into the war. As a result the Jews were much less oppressed when compared to what happened to the Jews elsewhere in Europe. When the Nazi’s finally took control in 1944 the Jews were rounded up and shipped out rather quickly. In a move that gives the film its title a number of Jews were given a chance to get out via train. It was a move that would echo down the years as people debated whether it was better that everyone should die together or if some should escape to continue on. There is a great deal to the story and you need to see it for yourself. As this posts it’s been almost two weeks since I’ve seen the film and I’m still haunted by it and selling it to anyone who will listen. Easily the best of the the four films and possibly one of the best individual films of the year. This is probably the most run of the mill of the Four Sisters films. Don’t let that fool you, since it will still hit you like a ton of bricks in the end. The story of Paula Biren who was a teenager when the Germans invaded Poland. She recounts in detail the existence of one of the ghettos. From the clearing of the designated areas by the Germans of gentiles, through the loading in of the Jews, its functioning and its destruction. It’s a cold matter of fact telling that is similar to other stories that we’ve heard before- however this is probably the first time where we’ve heard the story told by one person who was there from start to finish. Paula‘s telling is intriguing because she seems at times to be one of the most dispassionate observers I’ve encountered in Lanzmann’s work. She rattles off details with a kind of clinical precision. 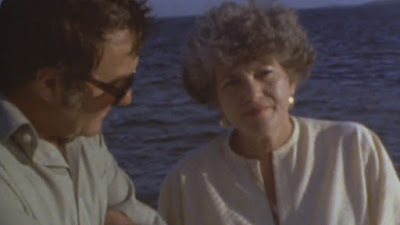 Her story isn’t something that she tells as if it something she has to sit down to tell, rather she literally takes Lanzmann on a stroll by the sea and tells it to him as if it were a fond remembrance. Its disconcerting and it draws us in. It also provides for one hell of a kick in the end when the mask slips and we see the pain in the final moments.